Zambia's original backpackers and still one of the best in Africa! Relax in tropical gardens with a gorgeous swimming pool and be just steps from the museum, markets, banks, and grocery stores. The Victoria Falls are only 8kms away and we offer a free shuttle every morning at 10am! Jollyboys has been catering to travelers since 1995; we love Zambia and our community and are happy to share our wealth of travel knowledge with our guests. Visit out our TRAVEL SHOP for great safari specials and you can book all of the exciting activities that Livingstone has to offer! Grab a burger at the bar and then settle into a wide choice of private rooms or dorms and enjoy a good night's sleep under a cushy duvet. Delicious, healthy smoothies or a big cooked breakfast await you in the morning before starting a day of soaking up the sunshine or exploring the wonders of Livingstone. Be a part of it... check out our community projects, worm farm, composting and our hot water and electricity powered by the rays of the beautiful Zambian sun. We take pride in our efforts to continuously strive to find new ways to be better in every way. We also have gorgeous shady gardens full of mango, banana, avocado, papaya, guava and lemon trees! We have an amazing book-swap (we're all bookworms here!) so bring a book, swap a book - we just ask for a donation for the orphanage - good deal! O ambiente é ótimo e tem tudo o que você necessita. Os funcionários são muito atenciosos. Excelente hostel!!! 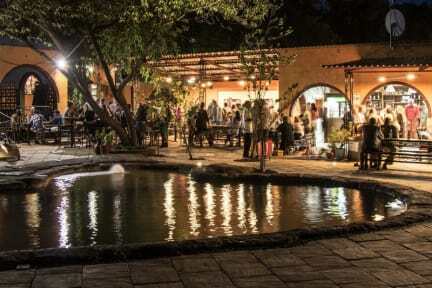 Com certeza o melhor lugar para ficar em Livingstone. Staff and the atmosphere was really good! I really enjoyed the time I spent in Zambia. Os dormitórios são grandes e espaçosos, porém acredito que faltaram telas para proteger os hóspedes dos mosquitos, que são abundantes na região (sem contar que é zona de malária). Apesas de alguns funcionários serem um pouco secos, a maior partes deles é extremamente atenciosa e solícita. Os chuveiros deixam um pouco a desejar no quesito limpeza (teias de aranha já fazem até parte da decoração, aparentemente) e, quando você entra neles, observará uma revoada de mosquitos.